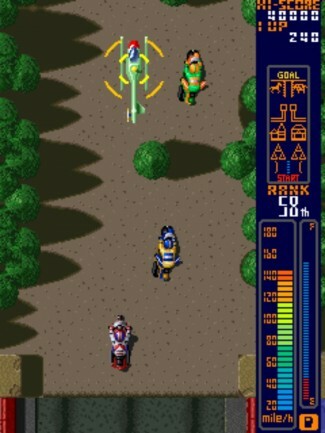 Drive a motorcycle through a series of obstacles and pass other riders. Passing enough of your opponents will allow you to reach the next level. There are six levels of play. Boards include jumps and bonus points, and a helicopter drops other bonus items including points, gas, and a turbo. Obstacles include other riders, cars, trucks, trains, trees and buildings. TRICK On the last section of the first level San Francisco, there is a jump that appears on the left when the surface changes. If you take this jump, you will end up on the bed of a farm truck. If you land without crashing, you will now be able to control the truck Hit up while accelerating and you will be able to blow past all the other bikers easily, which is useful for trying to make the cutoff rank. Also, if you move the truck to the extreme right, all the opposing bikes will come from in front of the truck and will be run over, allowing you to pass more easily. Note that you will not lose any gas while controlling the truck.PTRICK On Level 2 Los Angeles, there will be two tanker trucks that you will have to jump over AND out run. One is at the beginning, and one is in the middle of the level. You CAN bypass the second truck, however. Instead of taking the jump on the left, go to the right, and there will be a jump there. This can be a bit tricky with helpers, youll likely lose one if you take this jump. If you dont crash, youll land on a pier, away from the tanker. Bikes will appear on the pier, but can be easily dodged, or can be taken out if you still have a helper or two. A jump at the end of the pier will put you back on the main course. To ensure a safe landing, move the bike to the left while in the air.